If you’re looking for a Summit County home that truly reflects mountain life, I know just the neighborhood for you. 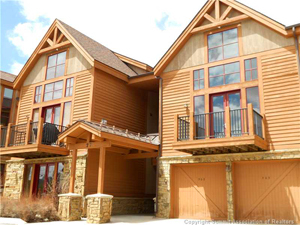 Antlers Gulch in Keystone is a terrific townhome community located along the mountainside and surrounded by scenic spruce and pine. You can’t help but have a gorgeous view when you live in this development. Plus, you’re free to hike the national forest right outside your door or fish from the Snake River any time you’d like. You also have access to the River Golf Course/Nordic Center right across the street. Best of all, the Keystone ski resort is just a 5 minute drive away. You can even take Keystone’s free resort shuttle whenever you wish. So you’re able to ski or participate in any number of mountain sports at your leisure. The townhouses’ interiors are just as lovely as the neighborhood itself. These roomy townhomes are decorated with rustic touches that include stained natural wood with timber accents. The rooms have stone and cherry wood flooring, too. Antlers Gulch townhomes are also equipped with spacious bedrooms, full kitchens, living rooms with flagstone fireplaces and French doors that lead to a beautiful patio area. For mountain living that makes comfort a priority, the townhouse community at Antlers Gulch has everything you could ever want and then some! Want More Info on Antlers Gulch? As you can tell, Antlers Gulch is a great mountain neighborhood with many attractive qualities for first-time homebuyers or for those looking to purchase an additional property. So if you’re interested in seeing this development in person, let me know and I can set up a tour that works with your schedule. I’m also available to search for other listings that might suit your living needs. In fact, if you’d like to check out a different neighborhood in Summit County, feel free to read my recent blog about Pine Ridge. That’s also another lovely neighborhood I highly recommend. Or, if you’d like to sell an existing home, I can also help you through that process from beginning to end.